The historical city center of Madrid is famous for its quaint picturesque medieval streets and some of the most beautiful terraces in Madrid. Our customers are always at awe when we guide them on one of our many Madrid tapas tours for some of the best Spanish tapas in Madrid, stopping at several Madrid tapas bars with terraces. with a fun and exciting run-down of Madrid’s past and present relevant history. Our Madrid tapas tours are bi-seasonal because as locals say here “Madrid has two seasons, Summer and Winter .” On a positive note, Madrid terraces are usually open all year round because of the amount of sunshine we have per year. It is an amazing feel to be eating some of the best Spanish tapas in Madrid in the middle of January at one of many relaxing Madrid Tapas Terraces. That is exactly what we do at Native Spanish Tapas, we take you on a fabulous Madrid tapas tour where real locals go for some of the best tapa bars and taverns or in terraces in Madrid. 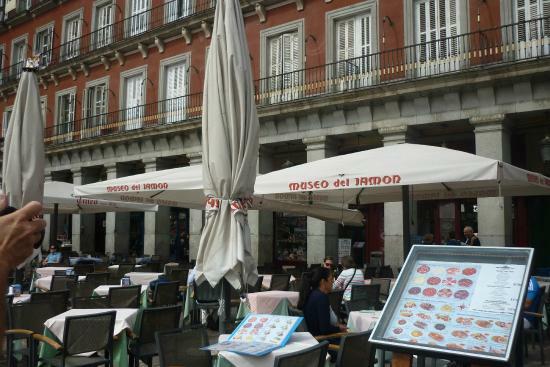 If you want to go to the Plaza Mayor and sit down at one of the many terraces overlooking this beautiful and over 400 years old square, we highly recommend going where local’s go and where Native Spanish Tapas Madrid Historical tour takes you, to the one and only Museo del Jamón, or Ham Museum. They do not have touristy prices because they do not only live from tourists as most other terraces do in the Plaza Mayor. 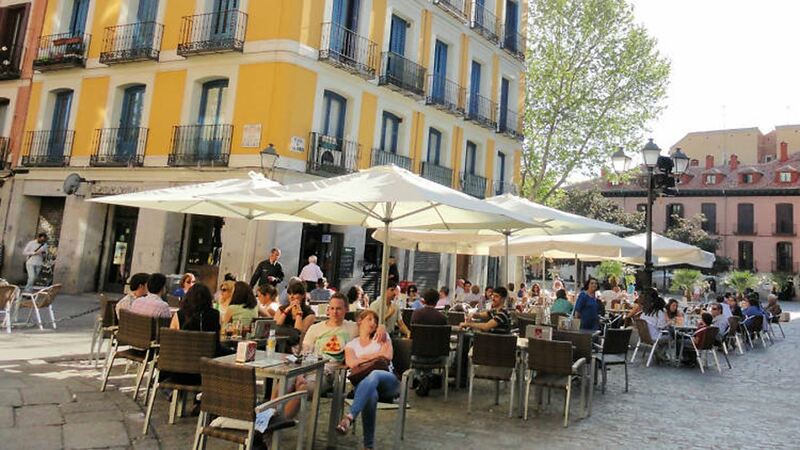 Madrid locals go to this favorite Spanish Tapas Restaurant to sit down inside or at one of the terraces to enjoy the sun, sangria, wine or beer, along with some of the best Spanish tapas in Madrid.